NAIROBI (HAN) March 22. 2016. Public Diplomacy & Regional Security News. AN OUTBREAK of public protest unprecedented in its duration and spread since the ruling party took power in Ethiopia in 1991 is stirring a rare cocktail of discontent. Demonstrations started in November mainly by members of the Oromo ethnic group, which accounts for about a third of Ethiopia’s 97m-plus people, have refused to die down. Indeed, they have spread. 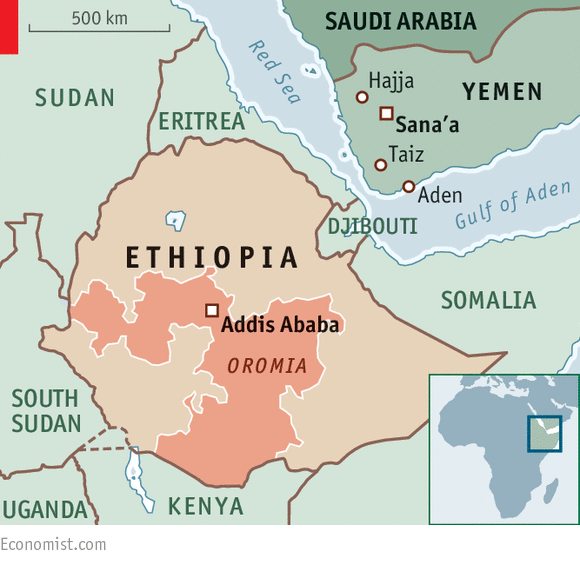 The government has dropped its plan, the original cause of the hubbub, to expand the city limits of Addis Ababa, the capital, into Oromia, the largest of the federal republic’s subdivisions of nine regional states and two city-states. But the protests have billowed into a much wider expression of outrage. People are complaining about land ownership, corruption, political repression and poverty. Such feelings go beyond just one ethnic group. Human-rights advocates and independent monitors reckon that at least 80 people and perhaps as many as 250, mostly demonstrators, have been killed since the protests began. The government says the true figure is much lower and instead lays stress, as it always does, on terrorist and secessionist threats to the country’s stability. It points out that foreign-owned factories have been attacked, churches burnt down and property looted by organised gangs during the protests. Last month seven federal policemen in the south were killed by local militiamen during a particularly violent wave of disturbances. All the same, most of the protests have been peaceful. The Oromo particularly resent the sale or lease of land (almost all of which is state-owned) by the government to foreign investors. The government’s decision to shelve its master plan to expand Addis Ababa is regarded by the assorted opposition as a rare step in the right direction. But the protesters say the government must now allow Ethiopians to exercise their constitutional right to express dissent, or discontent could escalate. The army was deployed to bolster the federal police in the south. Both are regularly accused of brutality and are generally deemed able to operate with impunity. Shooting at protesters and arbitrarily arresting them, especially if they are students, has a long tradition in Ethiopia, going back to the military dictatorship that ran the country from 1974 until its downfall in 1991. 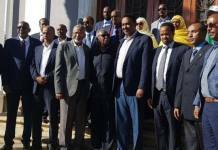 The government is particularly suspicious of the Ethiopian diaspora, especially its representation in America, which fled abroad during that period. The foreign-based opposition, bolstered by social-media campaigners in America, is stirring things up for its own malign purposes, says the government. That, argues the opposition at home and abroad, is what it always says when seeking to discredit peaceful dissent. In any event, tension is bound to persist because the ruling Ethiopian People’s Revolutionary Democratic Front, which takes China’s top-down style of authoritarian government as a model, is loth to loosen controls at the centre, despite the federal constitution. For their part, critics of the government cannot escape from the fact that it has until now succeeded in holding together a diverse collection of ethnic groups. Moreover, under the current government the economy has boomed and poverty has fallen sharply, though a severe recent drought is causing new problems. Neither the government nor the federal system, however imperfect, is under immediate threat. Meanwhile Western governments, with America and Britain to the fore as large donors of aid to Ethiopia, have been notably silent about the turmoil. In a region battered by terrorism and violence in such nearby places as Yemen, South Sudan and Somalia, Ethiopia is still regarded as an anti-terrorist bulwark.